If you notice that your clapboards or shakes are damaged or broken, your exterior siding will no longer be able to do a good job and need to be replaced with a new one. It can no longer prevent air, water, dirt or even insects from penetrating into your walls. It can also allow decay and further damage the wood within its surrounding. You should be replacing your damaged exterior siding with a new one with the same size and shape. Below are some of the steps or tips that you can learn whenever you want to replace your exterior siding. First thing that you need to do is to wedge your existing board away from your house. It can be done by driving the wedges up under the damaged board so that you can pull it out from the sheathing below. Make sure to check for the nails in this section of the clapboard and take the nails out by using a claw hammer or pliers. If you cannot remove it, you can simply use a hacksaw to cut them off flush together with the sheathing. In order to release the board’s top section, you need to drive the wedges beneath the clapboard that overlaps your damaged board before you can start to remove the nails from the top of your board. Next step that you need to do is to cut through the board on each side of the damaged sections with a backsaw or a hacksaw blade depending on the area of your work place. Whenever you use a hacksaw blade, you should wrapped one end of it with an electrical tape in order to protect your hand. Make sure you cut all the way through the board inclusive of the damaged section. If only the need arises, you need to move the wedges to create space for the saw and leave the wedges under the clapboard. Once the board has been completely cut through on both sides of the damaged siding, you can easily pull down and take it out with ease. If it still resist, you can just break it carefully by using a hammer and chisel without damaging any of the surrounding boards. Take your new clapboard and cut it accordingly to fit the opening and make sure that it fits the damaged area. If you do it accurately, it will slide in right into place with its top edge under the board placed above while its bottom edge over the board below. If the need arises, you have to plane the edges to get the correct fit. Once the new board has been securely fit into place, you can proceed with the painting task with a primer coat. You must ensure that both sides and all edges are covered completely. You need to also paint the raw edges of the opening where your old damaged siding was cut. When you finish painting them, leave them to dry thoroughly. Then, you need to set the board into the opening and ensure that it fits in nicely. Next, the board should be nailed into place using 16d nails. Make sure that it is driven through the bottom and through the board above and into the top edge. After that, you have to caulk the edges of the patch using acrylic latex caulk. Once the caulk has dried thoroughly, you can proceed with the painting task of your new siding to match the color of your house. After finish painting and the paint have completely dry, you can slide the new clapboard into the gap. Make sure that its top edge under the board is situated above while its bottom edge over the board below. 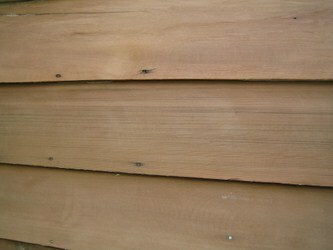 As for damaged shakes or shingles, you can replace them with the same method as you use for the clapboards. If you are using natural unstained cedar, we recommend that you take your replacement shakes from within any inconspicuous area of your house and then use the new shingles on the area. By doing this step, you would be able to eliminate a new-looking of un-weathered patch within the repaired section. The next step is to wedge out each of the damaged shake or shingle by driving wedges beneath the damaged section and under the shakes that overlap it. Make sure to check for the nails in this section of the shake and take the nails out by using a claw hammer or pliers before you can remove the damaged shake. If you still unable to remove the shake, you can simply split the shake into several pieces using a hammer and chisel before removing them piece by piece. Finally, you can insert the new shake and nail it into place by using 16d aluminum nails instead of steel nails. As for any shake that does not have pre-drilled nail holes, you have to drill pilot holes for the nails in order to keep the wood from splitting. Make sure to decide on the best material that you should be using for your exterior siding. You need to do some research on the pros and cons of materials such as Fiber Cement, Cellular PVC Trim and as well as wood before you decide to replace your exterior siding. This entry was posted in Home Improvement on December 22, 2011 by Mike.